I like the sayings of the Desert Fathers (and Mothers), sometimes they are complex and sometimes they are simple. The one from today is simple. I like the simplicity of the saying because it is easily understood. At the same time, it does have depth to it. However, I am not about depth today, but some simple commentary. I like the way that Abba Gregory boils down what is needed to live a life of simple Christian faith. All too often, I find myself caught up in theology, philosophy, and political science. I am not saying that is wrong. They are important, and Christians need to engage in those fields. In fact, one other of the Fathers commends learning. It is an amazing view of books and their place. To me, it is also an amazing view of the place of Christian scholarship from one who had left the world in order to devote himself to the monastic life. [At the time he wrote, there was nothing like the modern Christian cheap romantic tales available in every Christian bookstore.] The idea that acquiring Christian books is a good thing and that just simply seeing them helps those inclined to scholarship to remember to not sin. And, he has a very good point, for sometime when I look at a book I have read, I remember to think about God. But, it is about Abba Gregory’s saying that I am writing. And, his saying is written for each of us and is striking in its simplicity. The saying is written only for those who have been baptized. That is, it is not written for those who do not know Jesus, but for those who have come to know him. And, he says that if you have come to know him, only three things are really necessary. 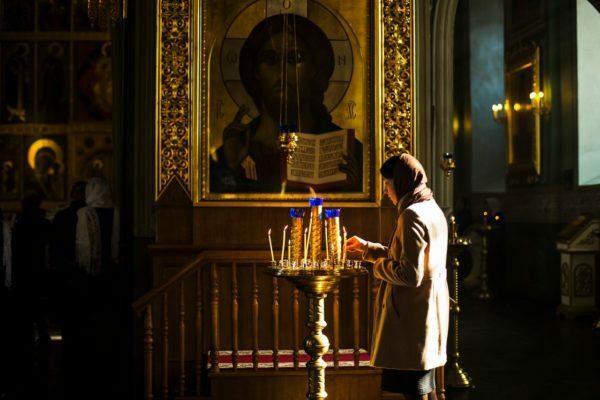 There is a need for a right faith, orthodoxy, but notice that it is to be held in the heart and not in the brain. This is not faith merely as intellectual content, but faith as trust. That is it is definitely not trust as over against intellectual belief, but that mixture of the two that keeps you in Christ. It must be right faith, but it also must be held in the heart. Truth on the tongue speaks to our right relationships with each other. Relationships based on lies do not work. Thus, we need to speak truth, in love, to each other. 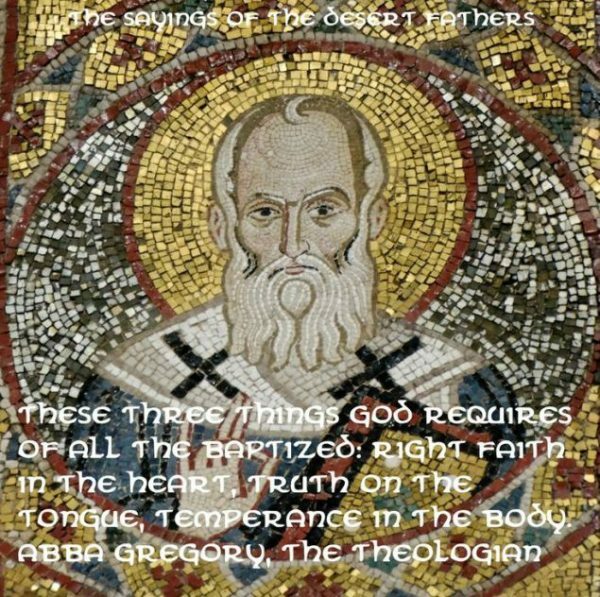 Abba Gregory is not talking about truth about each other. Rather, he is talking about speaking to each other in truthful ways. And, of course, speaking to God in prayer in truthful ways. Finally, temperance in the body is obvious. It is amazing how a whole set of “household rules” can be summarized in the simple statement about temperance in our behavior. Many, if not most, of what are called the cardinal sins in the West are sins of excess, of one type or another. Temperance works against gluttony, lust, accedie, etc. It is the stance to not overdo it toward any extreme. So, simple advice from a simple monk. Good stuff.